Desarrollado en 1945 sobre la base del IS-2 y el IS-3, bajo la supervisión de Joseph Kotin. Una de sus características distintivas era el equilibrado ángulo de inclinación de las planchas del blindaje. Superó con éxito las pruebas, pero nunca entró en servicio. The Object 704 is a Soviet tier 9 tank destroyer. A nice upgrade from the ISU-152, the Object 704 has good sloped armor, improved mobility, and an improved BL-10 cannon that fires faster, isn't quite as inaccurate, and takes less time to aim. Though it is, to all intents and purposes, the same gun as on the ISU-152, it still has very high penetration and alpha damage for its tier. Uses the same gun as the ISU-152 but with better aim time and accuracy. To add to the above, it still has amazing alpha and penetration. Has almost 60% more health than the ISU. Bigger profile than the ISU. Worse speed limit than the ISU. The Object 704 is, for the most part, a direct upgrade to the ISU. It uses mostly the same modules (2 of the ISU's radios, the same top engine, and the BL-10) and plays very similarly. Everything you learned from the ISU you will make use of in the 704, and you get some pros and lose some cons. The best upgrade you get is your gun. Your accuracy goes up by 0.02 and your aim time is lowered by a whooping 0.5 seconds, which makes hitting and picking targets MUCH easier than in the ISU. Secondly, the armor is a surprising upgrade. On paper, it only has 120mm of armor, but it is very well sloped. The sides of the front are also spaced armor, and landing a shot there does no damage. As an even bigger plus, your gun mantlet is EVEN BIGGER than on the ISU, making half of this tank's front effectively immune to damage. Further more, if the tank gets into a side-scraping position, to your surprise it will bounce many shots, even premium shels from tanks like the E-100. This happens because if you look at the Object 704 closely, you will see that it's sides are highly angled, the tanks sides were designed this way for the ricochets. However, you trade some things from the ISU. Firstly, the tank is wider to each side and is more prone to getting hit. You also lose 4 km/h top speed, which effectively makes the tank slower than the ISU. Other than that, it is very much an upgraded ISU, and is a good tank destroyer for its tier. You should have researched the BL-10 from the ISU-152 so put it on right away, so you don't need to play with the inaccurate derp cannon. You should also be able to add the better engine and the 12RT radio. This leaves only the tracks to research because with stock tracks turning is very sluggish. One prototype, developed in 1945, used elements of the IS-2 and IS-3 tanks. The overall height of the vehicle was reduced to 2240 mm, which was compensated with an increased width of the superstructure. The factory designation was Object 704 (Объект 704). It was armed with the 152.4 mm ML-20SM model 1944 (МЛ-20СМ обр. 1944 г.) gun-howitzer, with a barrel length of over 4.5 meters (29.6 calibers) and no muzzle brake, which further increased the firepower of the gun. It had a maximum range of 13,000 meters. 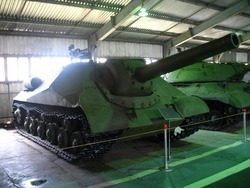 The self-propelled gun carried 20 rounds of two piece (shell and charge) armor-piercing and high explosive ammunition. The armor-piercing round, weighing 48.78 kg, had a muzzle velocity of 655 m/s. The rate of fire was 1-2 round/min. The ISU-152 model 1945 had four hatches at the superstructure roof and one emergency hatch at the bottom of the hull behind the driver's seat, which had an armored cover. 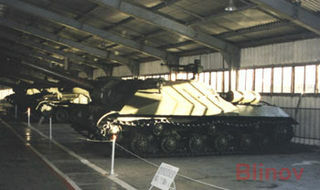 The self-propelled gun carried two external fuel tanks (90 liters each) not connected to the supply system. The secondary armament of the fighting vehicle consisted of two 12.7 x 108 mm DShK machine guns, one anti-aircraft and one co-axial. The protection was increased by placing thicker armor at more radical angles. In the area of the gun, where the mantlet combined with the hull front behind it and the housing of the recoil mechanism, the armor thickness was 320 mm. The ISU-152 model 1945 (ИСУ-152 обр. 1945 г.) was the best protected of all experimental or production Soviet self-propelled guns of the Second World War. However, the radical incline of the superstructure walls combined with the increased recoil of the gun, due to the lack of a muzzle brake, significantly complicated the work of the crew, and for this reason mainly wasn't adopted. Today, the self-propelled gun is exhibited at the Kubinka Tank Museum.